Well hello to you my reader chums! I have a big love for eye shadow palettes especially when they're full of neutral-based shades including cream-coloured shimmers, golds, matte browns and coppers. Tarte's Tartelette in the bloom' palette ticked every box for me and I couldn't wait to try the shades. I picked this up in New York after years of seeing its surrounding hype within the beauty blogging community. When it comes to beauty products, the first thing you're ever drawn to is the packaging. 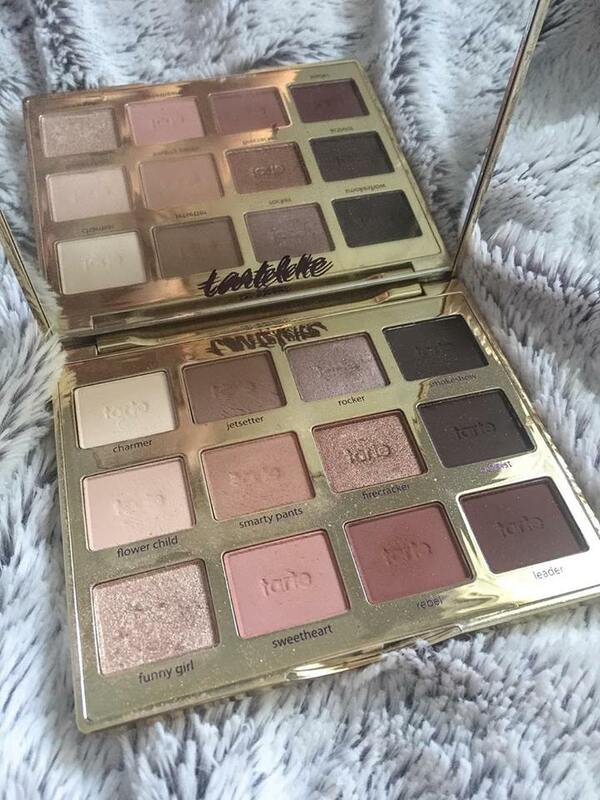 Tarte's 'in the bloom' palette is pleasing to the eye to say the least. Its water-coloured style design with a metallic gold rim, back and writing across the front compliment each other well. One of the main features I love about the palette is its shape. 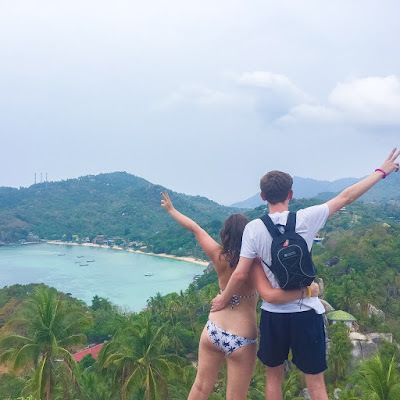 I have many long, rectangular shape palettes so its refreshing owning something of a more travel-friendly size with all the colours you may need. Also, the huge mirror you get inside is incredibly useful; as it's square you're able to see your entire face as you do your makeup. Neutral shades are my obsession when it comes to eye shadows. I love testing out new bronzes, golds, champagnes and coppers so if a palette has it all, that's a bonus! 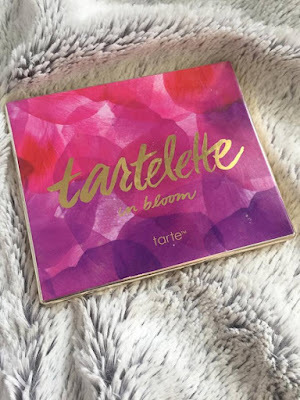 Tarte's 'in the bloom' palette ranges from a matte milky shade to a defined black colour. In between you have a shimmery champagne, warm pinks, everyday browns, fiery copper colours and two slightly darker red/burgundy shades. 'Tartelette in the bloom' palette is completely versatile with its shade range, ideal for a simple everyday look or easy smoky, copper coloured eye look. Pigmentation is the top feature when it comes to eye shadow. 'Tartelette's in the bloom' palette has intense pigmentation for every shade. The matte shades are that tad bit more pigmentated than the shimmer ones, however it doesn't take much to get that full colour pay off on the eye with every colour. Its darker shades especially, need the tiniest swipe to achieve a defined look for the crease of the eye. 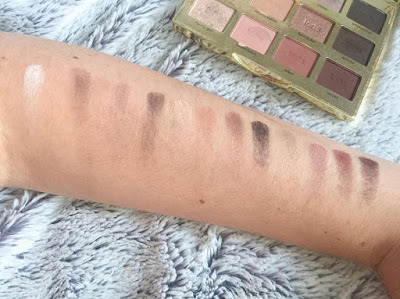 I'm obsessed with how pigmented each shade is because it means my favourite colours will last that little bit longer than your average palette. The eye shadows consistency is mix of soft and creamy, with the shimmery shades having more of a buttery feel to them. Their blending power is seamless, especially each of the matte shades. They'll blend through the crease like a dream and the pigment from the shimmer, layers on easily. I've never tested these shadows without an eye base or primer, however once the eye lid is prepped, these shadows can last a good working day. I wouldn't say they look as fresh by the end of the day as beginning, however they never crease, rub off or fade in colour. 'Tartelette in the bloom' palette's lasting power is as strong as their pigmentation, blending ability and shade range. The versatile palette that has every beauty blogger talking 'Tartelette in the bloom' provides a wide shade range, faultless pigmentation, insane blending abilities and long-wearing power. If you haven't given it a go, now is the time! I hope you enjoyed this beauty review. Have you tried the 'Tartelette in the bloom' palette? I really liked to read about this beauty review. A very interesting blog indeed. Do share more beauty reviews like this one. I am a crazy fan of beauty products and would love to read about them.